Smooth Acorn Whit Insert. Lenght : 5,87 in. / 149 mm (Lunghezza). Weight : 1,62 oz. Bowl Height : 1,65 in. / 42 mm (Altezza). Chamber deph : 1,10 in. / 28 mm (Profondità foro). Chamber Diameter : 0,81 in. / 20,50 mm (Diametro Foro). Outside Diameter : 1,89 in. / 48 mm (Diametro esterno). Stem Material : Metacrilato (Bocchino materiale). Filter : None / No (Filtro). Finish : Smooth / Liscia (Finitura). Material : Briar / Radica (Materiale). Country : Italy / Italia (Paese). Prize : 185,90 Euro. Tabaccheria del Corso Rimini (anche on-line store). Corso d’Augusto 128. The item “FatmOm pipes 4 $ NEW Fantastic Smooth Acorn -smoking Pipe, pfeife, pipa TOP” is in sale since Monday, March 13, 2017. This item is in the category “Collezionismo\Oggetti per fumatori\Pipe e accessori”. 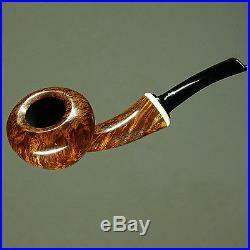 The seller is “fatmompipes” and is located in Rimini. This item can be shipped worldwide.